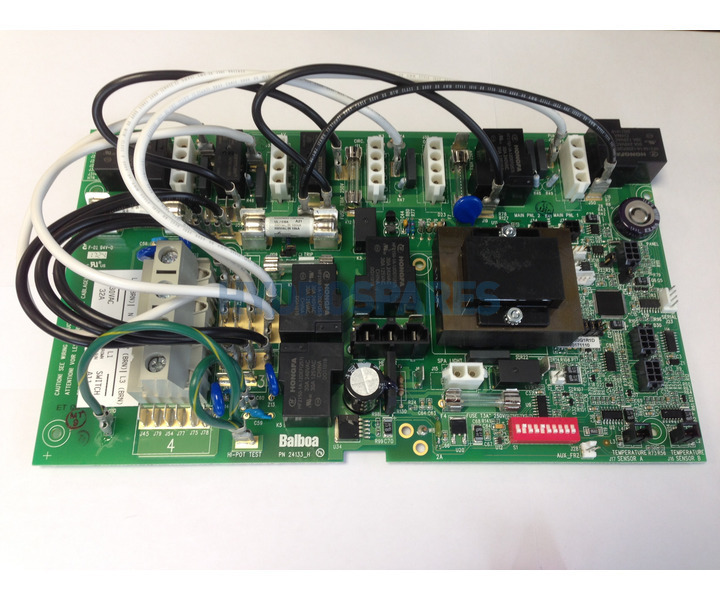 This circuit board is a genuine Balboa replacement for boards labeled 56392 fitted to plastic Balboa BP2100 Spa Control Pack. The PCB should be fitted with all the dip switch settings the same as the faulty PCB being replaced. For correct installation, the PCB should be fitted by a qualified tradesman or electrician. These are generic boards. If you are replacing a customised board you may encounter inconsistency with the topside control. Customised board are specified by the hot tub manufacture for specific models. Although the boards may look the same the will be programmed to the hot tub manufactures specifications. Custom boards are usually only available from the hot tub manufacture and, if available are usually quite expensive. If you do experience inconsistencies after fitting a generic board then replacing the topside control panel as well usually remedies this. Note: All equipment must be installed by a competent individual or trades person, in accordance with the relevant electrical & building safety regulations. Installing an incompatible PCB may result in damage to it, and other system components, which is not covered by warranty. PCB's and other sensitive electrical equipment cannot be returned if the sealed packaging has been opened, tampered with or if the item has been fitted. If a PCB board is suspected of being faulty, it will need to be returned to us within the warranty period so it can be returned to the manufacturer for inspection & testing. If the item is deemed to be faulty, we will repair or replace it under warranty. If the board is not at fault or is found to have been damaged due to incorrect installation or misuse then the warranty will be void and an additional charge will be made to cover the costs of return shipping. Verona is located in the north Italy, it was founded by Roman in the internal meander of Adige river and with its two houndres years of history is one of the most important destination for everyone who loves literature,culture and history.Verona hostes many roman structures such as the Arena,Arco dei Gavi,Porta Borsari and Porta Leona. Morover medieval buildings as Castelvecchio,Arche Acaligere,Juliets House and Lambertis Tower contribute in creating a magic atmosphere; however the charm peak will be reached on Ponte Pietra with its wonderful landscape which give extra value to the city. Verona is easy to reach, not so far from Garda Lake (30 km), you need only to take one Atv Bus from Sirmione,Lazise;Bardolino,Malcesine,Peschiera,Riva del Garda,Brenzone,Torri del Benaco and Desenzano to come here and to enjoy our citysightseeingIn addition the train station is only 1 km aloof from the city center; also Villafranca airport is only 15 km distant. Moreover Verona offers a wide range of choices considering restaurants,bars and shops but you should try our ice cream from Gelateria Ponte Pietra and Savoia. Returning to our main theme, you can visit all Verona by walking or by bike, anyway the best way to appreciate Verona is by Segway to save your time and energy a two-wheeled self-balancing, battery-powered electric vehicle. Dont lose this possibility. Verona Italy: Riding a Segway PT inside the second largest Roman city! From the perfect Roman warp of the streets, squares, walls and the Arena amphitheatre, to the pure Romanic and Gothic style of the beautiful churches and monuments you may visit during the tour. Lets be ready to discover the most beautiful and interesting part of the city, the most ancient, facing south and cradled by a bend of the river. After we get to know our Segway PT, from viale Colonnello Galliano parking and meeting point for the training we reach Porta Palio and ride past the roundabout along the cycle path facing Porta/via Piccoli. Another easy cycle path leads us straight to Castelvecchio, a residence of Della Scala family, whose internal restoration is a marvellous example of contemporary architecture. Riding our Segway PT we cross the Della Scala bridge and pause in the park on the other bank of the river, to enjoy a view on the bridge and castle. Afterwards we cross corso Castelvecchio to get onto via Roma to reach piazza Bra and the Arena. Exciting moments of deep romanticism may be lived thanks to our Segway PT that will lead us until Giuliettas House, in via Cappello. Mercato Vecchios court, Piazza dei Signori and Arche Scaligere will follow, until Santa Anastasia and piazza Erbe (Veronas Roman forum). Tour proceeds Under the portoni of Corso and Porta Borsari (ancient collection point of the bishops duty) and back, on the stradone Porta Palio.